Shortly after arriving in Honolulu to attend the Asia Pacific Leadership Program (APLP) I decided I would only read books about Hawaii while here. One that was recommended by an alumnus and surf fanatic was Eddie Would Go, by Stuart Holmes Coleman. I’m glad I read it in my first month as it influenced my impressions of Oahu and added a lot of depth to guest lecturers we met later in the course, namely Stuart and Nainoa Thompson. 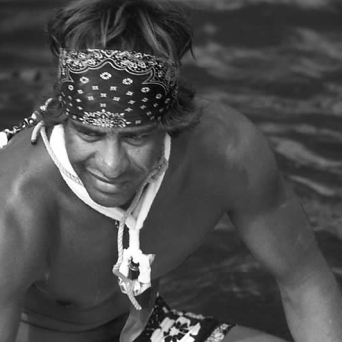 The book chronicles the life and untimely death of Hawaiian surfer and lifeguard extraordinaire Eddie Aikau. It was not only a thoroughly entertaining and moving book about a legendary Hawaiian but also did an amazing job of introducing the island of Oahu back in the 1950s up until Eddie’s death in 1978. Without giving away too much about the book (it’s well worth a purchase), Eddie met his fate while crewing aboard the Hokule’a, a double-hulled Polynesian voyaging canoe, on its second journey from Hawaii to Tahiti using only the sky and traditional navigating techniques. On May 16, 1978 the Hokule’a set sail in poor weather, soon thereafter water filled her hulls off the island of Molokai, she overturned and after a terrible night bobbing in high seas Eddie was granted permission by the ship’s captain to paddle on his surfboard to the island of Lanai for help. That was May 17, the last day Eddie was seen. It was a monumental loss for Hawaiians and watermen worldwide. Nainoa Thompson was the navigator on that journey and is mentioned several times in Eddie Would Go, where I first heard of him. When reading about Eddie’s disappearance, trying to save his fellow sailors, I often thought about the weight his death must have had upon Thompson, who rather than let the Hokule’a’s mission die (many wanted it to be put in a museum after the disaster), took some time to gain perspective from the incident and eventually returned stronger than ever. Thompson is currently President of the Polynesian Voyaging Society (PVS) and has been the driving force behind their voyages over the last 36 years. Not only has the Hokule’a sailed the equivalent of six trips around the world, but Thompson has taken a dream of proving that Tahitians did indeed sail to Hawaii more than a thousand years ago and grown it into a mission that now educates students, trains navigators and inspires people around the world. I was delighted to learn we’d be visiting the PVS on November 30 as part of our studies, meet Nainoa, then sail with him in the evening, learning a little bit about navigating using the stars. Our cohort of 40 sat on chairs in a large circle in one of the PVS’s classrooms and Nainoa was two seats from me. Small in physical size, I was mesmerized at his quiet demeanor and Yoda-like answers to our questions. We had roughly an hour to converse and his answers were vast, multi-sided and totally inspiring. He spent about five minutes answering most questions, covering an incredible variety of angles and delving so deep at times I forgot what the original question was, but everything and every word he uttered was mesmerizing. He’s truly a legend and one of the most inspiring characters I’ve ever met. 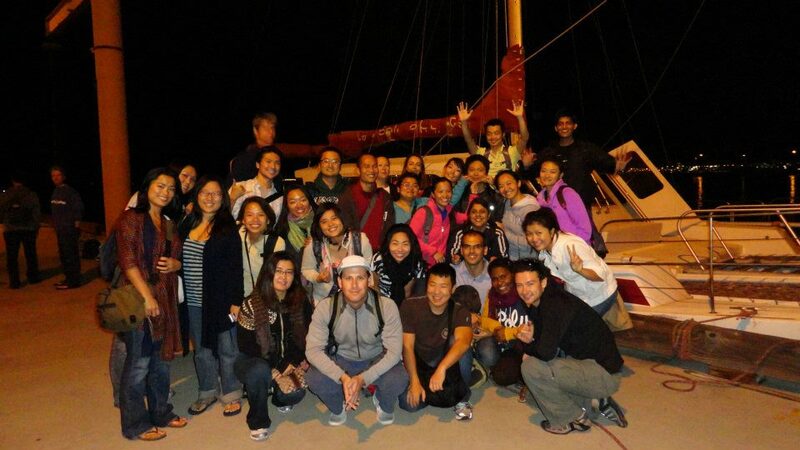 Learning, Planning, Training, Practice are the ingredients to a successful voyage. Being an entrepreneur and running Smiling Albino over the last 12 years I drew a lot of inspiration from this. Not only is it necessary for a successful voyage but for any sizable, meaningful project to achieve success. Sometimes it’s easy to lose sight of this simple fact and when you fail it’s likely you haven’t done the aforementioned properly. The Doldrums provide fear and inspiration. Thompson loves the doldrums, the windless, tough-to-navigate, cloudy area around the equator most sailors fear. He loves it because this is where fear and uncertainty live. In order to achieve great success you must get to the point of fear, be at its door and have the courage to open it and move forward. The doldrums provide this opportunity. One must plan/earn the voyage. While there were many minutes of explanation behind this statement it’s incredibly true and applies to almost any big undertaking. An idea is just an idea, a plan is just a plan, but all elements and people must come together and plan together to achieve success. There are no fights on our voyages (most are about 30+ days) as everyone trains so hard and fully understands the voyage is much bigger than them. To get a team all on the same page for a small project is no small feat. To do so for a multi-day voyage across the world where lives are at stake and one misstep can spell disaster is incredible. Any team or company to be successful must truly understand this point and believe it wholeheartedly. Thompson: You must be able to ‘see’ Tahiti to get there. He told us how Eddie would say he was going to “Pull Tahiti from the water,” literally envisioning their arrival, propelling the crew to their destination, believing in their mission and being able to see the goal. Too many times we embark upon projects and missions where we don’t really believe we’ll achieve success. If you can’t see it, you won’t succeed. One of the most profound messages Thompson shared was of practice. We all know that to become proficient at something it stands to reason one must practice – lots. While we practice to learn a language, how to play an instrument or get good at a sport, often with work or projects we somehow don’t put the same time, energy and practice in. During the time of Eddie’s Hokule’a voyage the crew would do a couple practice sails before heading out. Crews since then, log about 5,000km around Oahu and the Hawaiian islands before heading out for the real journey. The message: there’s no substitute for practice and preparation. This is likely one of the main reasons crews have had so much success since that infamous 1978 journey. Our evening with Nainoa will stand out as a highlight of my time in the APLP and one moment in particular still has me buzzing. He looked at all 40 of us sitting in our circle and talked about the importance of Eddie’s death. At that time Hawaiians were expected to fail and things Hawaiian were perceived as flawed. His death proved it. Hawaiian culture and values were at the beginning of a renaissance and his death could have spelled the end of popular Hawaiian culture. Instead the PVS pushed forward, made much good from a terrible incident, and Eddie’s death has in many ways not only kept the PVS mission alive but elevated Hawaiian culture and inspired thousands not only in Hawaii but around the world. Thank you Nainoa Thompson for your time, inspiration, teachings and making my Hawaiian experience that much richer. The Hokule’a is currently in dry dock undergoing a complete restoration, preparing it for a 2013 Worldwide Voyage and another 36 years on the high seas. I am proud to have been in the same room with you, Nainoa, and the rest of the APLP cohort. 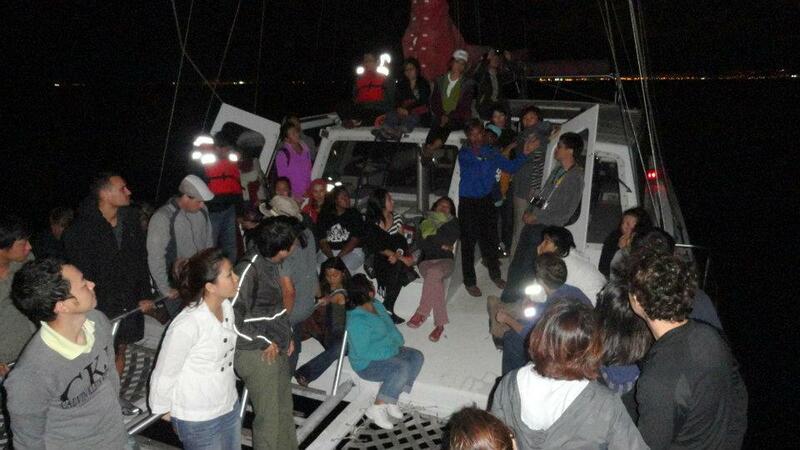 It’s an experience I’ll never forget, and it’s no wonder why the first APLP baby was named after this great navigator. I am amazed of how humble Nainoa is, despite the fact that he is the living legend.. Thank you Scott for having put into words what we all experienced that night with the Legend. Each of us had different takeaways, all as intense and deeply meaningful as yours.